SUBJECT: NEW BISHOP CREEK CANYON SUMMER CLASSIC TROUT DERBY OFF TO A GREAT START! In an effort to lure a few more anglers to the Eastern Sierra this summer, the Bishop Area Chamber of Commerce & Visitors Bureau, along with several partners, is promoting the new Bishop Creek Canyon Summer Classic Trout Derby. The month-long contest got started just a few days ago and will run through the end of June. The first tagged Alpers was reeled in today, and what a beauty! 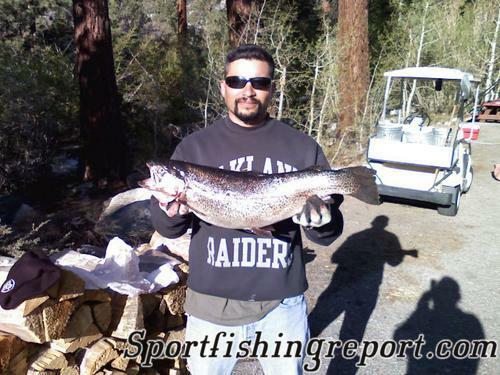 Gabriel Figueroa of Alta Loma California caught the 8 pound (+) fish at Intake II. (See attached photo). As if the fish wasn't a big enough prize, Gabriel also claimed a $50 cash reward, plus entry into the grand raffle to be held at the end of the month! The new Summer Classic derby represents a collaborative effort between the chamber of commerce, area resorts & tackle shops, and the County of Inyo. "We've always known that derbies are a great draw for anglers," explains Tawni Thomson of the Bishop Chamber. "The early season Blake Jones derby has been attracting about 900 participants each year for four decades. Thanks to the generous grant sponsorship from the County of Inyo, we were able to launch this new project, which we hope will entice visitors to the region for the entire month." Without the support of the County, it would be difficult (if not impossible) for the chamber to raise the funds for fish planting ($5,000 worth of Alpers Trout have gone into the lakes), plus the cash prizes (totaling another $5,000). Thirty-five tagged Alpers Trout have been placed in the still water fisheries of the Bishop Creek Canyon ��� Lake Sabrina, South Lake, North Lake, Intake II, and Weir Pond. The tags correspond to prize amounts of $50 to $500. In addition to the tagged fish, all of the lakes have been heavily stocked. Registration is just $5 (free for kids under 12) and you can sign up at the Bishop Chamber, local tackle shops, and any of the many businesses in the Bishop Creek Canyon - Parchers, Bishop Creek Lodge, Lake Sabrina Boat Landing, Creekside RV Park, Cardinal Village or South Lake Boat Landing. Even if you don't manage to catch one of the tagged fish, you could still be in luck as all registered participants will automatically be entered in the grand raffle to be held at the end of the month. Raffle prizes will include more cash, a 3day/2night fishing package, plus other great items donated by Lip Ripperz, Okuma, Berkley & High Sierra Woodcarvings. Not bad for your $5 investment! For more information, contact the Bishop Area Chamber of Commerce and Visitors Bureau, 690 N. Main Street in Bishop, or visit www.bishopvisitor.com. Reach them by telephone at (760) 873-8405.